It's time again for the Concept Art Writing Prompt, where we ask you to write a piece of flash fiction in response to an unusual piece of artwork. 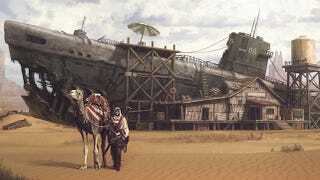 This week, we're headed into the desert, where, of all things, a submarine lies rotting. You're the author, so tell us: How did it get there? This piece of concept art comes from Pene Menn, via reddit. If it inspires you, write a brief story and post it in the comments. I hated desert jobs. I had to leave my bicycle in Rem Hareth, and even though I'd triple-locked it to the storage unit at Jem's, I feared she was already stripping it down to sell for parts. But with new Borzaroth Armada ships being uncovered every week, it made sense to stay until I'd cleaned up as many boats and subs as I could. But as my feet sank into the sand, I longed for the touch of the pedals. The scavenger-merchants were nomadic, always building their shops directly into the wreckage of whatever tub they came across, and staying until the place was emptied of navy-issued dinner plates and clean linens. When there wasn't a scrap of good merch left, they'd sell the place for a few tabs to a family that needed shelter more than proximity to civilization. This wreckage had a cozy, if crude, bamboo house jutting from its guts. It almost reminded me of the beach vacation homes I'd seen in ancient photographs. I did a lap of the sub, inspecting the markings still visible on its decaying hub. I pulled out my journal to double-check, but they were clearly from the third wave of submarines from Ba-oul, a small city-state that had attempted to secede from Borzaroth during the water wars. I consulted my journal for the proper incantation before walking inside. The floor gave a little as I stepped inside the shop, rattling the goods lining the shelves. The place was packed with neat rows of spoils: glasses, silverware, metal gears — all the things no one bothered to make anymore. I shook my head at a folded stack of crinkled officers' uniforms, their decay-resistent fabrics freshly laundered. Despite their obvious utility, a small wooden placard labeled them "pajamas." Nobody wants to learn about the past anymore. Everyone just wants to sell it. A petite clerk raised her eyes from an issue of last month's Kultura and quickly pulled a scarf over her hair. "Are you the exorcist?" she asked, rising from a table covered in knick-knacks from the submariners' quarters. I used my half-dead arm to lift a St. Christopher medallion from the table, trying not to smile as her eyes widened. I swept the arm in an exaggerated arc, letting it flop through the air like a speared rattlesnake. "So you have a ghost problem," I said. She nodded, her eyes still as wide as tea saucers. "We didn't think this sub had one. We got it half-unloaded before it showed up, screaming and howling. My brothers won't go back there anymore." I didn't blame them. The ghosts themselves were harmless, but they were a symptom of an active AI. Touch the wrong bit of equipment and you'd have a few hundred volts traveling up your arm. "What did you do with the bodies?" I asked. Her eyes drifted to the table. "We…we burned them." I laid down the medallion. "Lazy," I muttered. Most scavenger-merchants were superstitious enough to bury dead bodies when they found them, although sometimes they didn't bury them deep enough to dampen the ghost operator's neural chip. Burning the bodies did no good. The chip was paper-thin and immune to fire; it got tossed around the wind with the ashes and was probably sitting just a few miles away under a millimeter of sand. "I'll have to confront the ghost directly, then," I told her. "It's a more dangerous procedure. More expensive." She brightened at that. "That's no problem!" She bent over, fishing for something beneath the table. Strands of black hair spilled from beneath her scarf. She stood back up and thrust a filing cabinet drawer into my arms. "We found these in the pantry." I balanced the drawer with my good arm and peered inside. Dozens of glossy brown packages shimmered in the low light, each stamped with words "Meal, Ready-to-Eat." My mouth watered. "They're the good kind," she said. "The ones that heat themselves." Of all the technologies we had lost, self-heating meal packets was the one I regretted the most. "It's a deal," I said. "Where's the ghost?" The clerk ran to the front door and yanked it shut, bolting the lock behind her. "I'll show you to the engine room." "Aren't you afraid?" I asked. Most people left the boat entirely while I did my work, not wanting to be tainted by the spectral energy. I preferred it that way. I hated the idea of concocting some pointless show to alleviate their fears. She wobbled her head from side to side. "I want to see you do it." I inhaled the familiar chalky smell of the engine room, wondering, not for the first time, if it had smelled that way when the sub was in use. These rooms were my office space — different from boat to boat, but comforting with their familiar pipes and dials. We walked to the back, to the silver podium that sat on the far end of all those tubes. The AI lived here, I knew, where we'd have the best chance of making contact with the ghost. "Is that his home?" The clerk pointed to a faint light on the podium, which blinked green every few seconds. Amazing to think that, even after thousands of years, the bulb hadn't burned out. "More or less," I told her. "Are you going to destroy it?" I laughed, wobbling my half-dead arm at her. "I made that mistake once, a long time ago." She shrank back, clutching her hands against her chin. "So what are you going to do?" she asked. I sighed, wishing I had a less humiliating ritual for this. "Hey, ghosty!" I shouted. "Officer Ghosty!" Nothing. I consulted my journal. "Freedom for Ba-oul!" That did it. The ghost materialized, and I heard the clerk gasp behind me, her fingers digging into my half-dead arm. Most of the ghosts I encountered were senior officers, middle-aged men with hard-lined faces. This man was younger, earnest. No wonder he had screamed at the clerk's brothers; he was probably as afraid of them as they were of him. I looked down at my journal, quickly reviewing the incantation. "Barzaroth pushed the Pementhian fleet in the Battle of East Klemor, but the battle would not have been successful without the help of the Ba-oul navy. In gratitude, Barzaroth awarded Ba-oul its independence, and the city enjoyed a thousand years of prosperity." We waited a moment, and finally the ghost opened his mouth, his small whisper pumping from the sub's speaker system. "So we did it?" he asked with a tentative smile. "We won?" I nodded. "You won. Mission accomplished, sir." The ghost vanished, and my eyes shot to the podium. The light had stopped blinking. As we headed back toward the shop, the clerk asked, "Is it true, what you said? About the ghost's city?" I replaced my journal in my pack. "No." "Don't you ever feel bad? Lying to ghosts like that?" I shook my head. My journal was a collection of alternate histories from dead civilizations, hundreds of ways the world could have been different. But in the end, they all landed here, in a time where the seas had turned to deserts and we couldn't make self-heating meals, much less submarines. "No ghost's truth is any better than any other's."